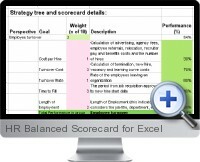 Measure and control the performance of HR department with the Excel HR Balanced Scorecard. This scorecard has some key metrics that will help to measure and control the performance of a Human Resources department. Cost per hour – salary and calculation of indirect costs such as agency fees, relocation and expenses incurred for the employment. Turnover cost – calculation of termination, new hire, and vacancy and learning curve costs. Turnover Rate – the rate that employees leave the organization. Time to Fill – the period from the job requisition date to the new hire start date. Length of Employment – time of employment including consideration of job title, department and other classification characteristics.